Arthroscopic Lateral Retinacular Release is a procedure performed to correct problems with the patella (kneecap). It is performed arthroscopically, which means that the interior of the knee joint is examined using an endoscope that is inserted through a tiny portal incision. Tracking is the term used to describe the movement of the patella with the knee. 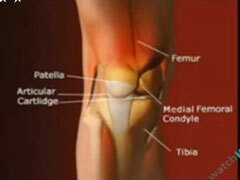 Lateral release is performed when the patella becomes misaligned and does not track properly. Tightness in the lateral retinaculum, a tissue in the knee similar to rawhide, usually causes this condition. Some patients have a genetic predisposition to retinacular tightness and laterally riding patellae. Other patients misalign their patellae with a twisting injury or a blow to the kneecap. When the patellae are injured in this way, the retinaculum shrinks and gets tough, which causes the kneecap to fall off track. Lateral release involves cutting the tight lateral ligaments to allow for normal tracking of the patella. The orthopedic surgeon first makes a small incision in the retinaculum through the arthroscope. He then cuts the tight ligaments on the outside (lateral side) of the patella to allow it to slide toward the center of the femoral groove. These ligaments eventually heal with scar tissue that fills in the gap created by the surgery. Lateral release surgery takes 30 to 45 minutes and can be performed under local or general anesthesia. The patient will need to use crutches for at least five days after surgery. To ensure speedy recovery, rest is required. Activity should be limited to light household activities for the first five days. After this period, movement can be gradually increased according to doctor’s orders. Soon after surgery, the patient begins a period of physical therapy that usually lasts 12 to 16 weeks, depending on individual progress. Most patients can resume normal activities at this time, although complete recovery takes six months to one year. Complications may arise due to unexpected bleeding in the joint following surgery, overly intense physical therapy, or unanticipated severe joint abnormality. You may need to take pain medication. Your knee swells or hurts following surgery.